So, we’re talking about Nightlings, eh? If we must, we must. I don’t mind killing them, it’s the burning of the carcasses wich disturbs me. I know that it’s necessary to prevent disease and all that but you can never get the stink out of your clothes. It’s good practice, killing nightlings, it keeps you fit and sharp. It’s better than digging coal anyway. I could have gone into the forge work like my brother, I suppose, but working with Gnomes would have driven me around the bend! They’re always blabbering on about this great idea or this wondrous invention and no matter what you do, they could have always done it better! When the coal is delivered, though, you don’t hear a peep from them and they’re off like a shot! You’ll never see a gnome lift a shovel or heft a sack but you might find one spending weeks designing an elaborate coal-lifting engine. No, the army is the place for me. I have served in the army my entire life and my experiences, wielding the axe in the name of my lord, are what made me what I am. Before I was old enough to lift a weapon or pull the string of a crossbow, I would help my fathers regiment by feeding the Nalrim beasts, polishing the weapons, cleaning the boots. For years i watched and listened as i worked, learning all the while. my friends would come for me, asking me to go climbing or play a game with the gnome children but I wouldn’t leave a job until it was finished. I had a purpose in life even at that young age. I knew what I wanted and I knew this was the way to get it. So, if I went climbing with the others it was because the skill of climbing would come in useful later. I spent my time preparing myself for when the wasteful time of childhood would be over and I could join the clan warriors. If I was to be chosen to guard the gates, then that was as it should be, but I dreamt of the clan warriors and the battlefield. 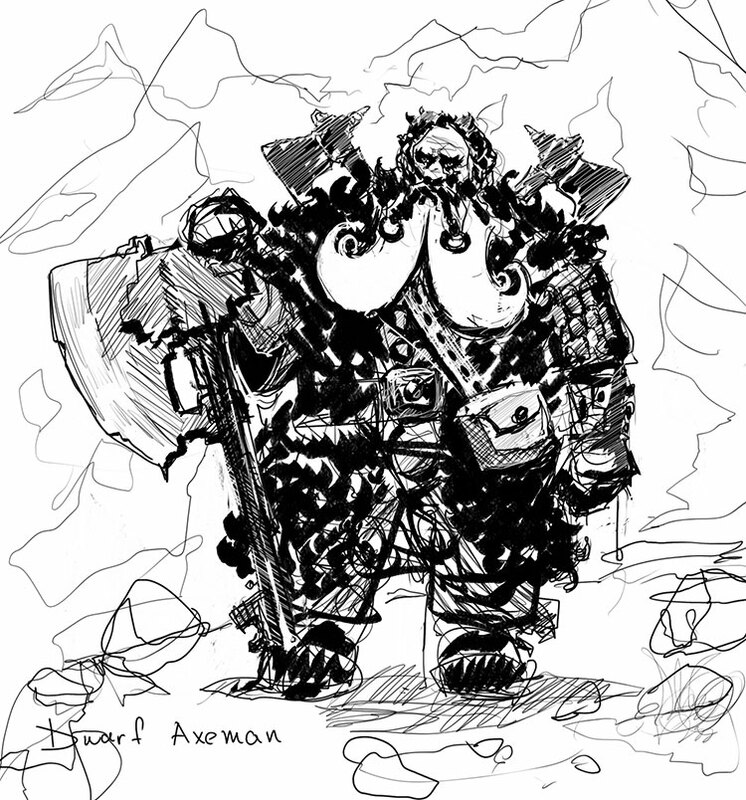 Dwarves are a short, stalwart race whose warriors are renowed for their skills with the axe. It is a social custom for their men to have impressive beards and they will often plait their hair to keep it out of the way during battle. Rumours persist among most other races that dwarves live in dark and dingy tunnels hewn roughly from the rock but they actually live deep within the mountains in thousands of brilliantly carved out tunnels and underground cities, with streets, halls, libraries, workshops, homes etc. Travellers and adventurers are very unwelcome in their underground abodes but they are tolerated if they have a contribution to make. Dwarves make friends very seldom but when they do, they are fiercely loyal and protective. They have a great respect and admiration for the achievements of their ancestors, and as such, their laws and beliefs tend to be ancient and solid. Their system of law deals with crime in a swift but efficient manner: If you are caught stealing, the courts will confiscate all your possessions; if you commit treason, you will be branded and banished. The death penalty is used only by the military courts to punish desertion, cowardice in the face of danger, etc. their justification for this? A dwarf’s best friend is another dwarf and if your actions endanger the lives of other dwarves, i.e. your comrades in arms, then you do not deserve to live. End of story. Dwarves are natural fighters and their society, structured around honour and glory is quick to reward excellence. When a particularly sterling warrior is brought to a clanlord’s attention, he will be promoted to a position of responsibility such as kings bodyguard or henchman before being returned to the ranks as a hero. They are then expected to make a name for themselves by continued acts of bravery and heroism above and beyond the call of duty. To fight alongside a hero is what dreams are made of in many a dwarf home throughout the land. Champions are the acknowledged best all-around fighters of their particular regiment and are promoted to this class as an honour of service to their lords. They are then responsible for maintaining the honour of their regiment and for motivating and inspiring the troops to the best of their abilities. The responsibility of the guard is to protect the gates to the underground cities, the first line of defence against the outside world. usually armed with spears, short swords and shields, they are also used in battles to support the centre point of defensive ranks. the uniforms of the guard vary widely depending upon wich clan they are from and for wich gate they are responsible. for example, the guardians of the great eastern gate (also called the gate of rising sun in some records) are clad in tunics of silver and gold and carry shields emblazoned with a symbol of the sun. the great western gate is protected by guardians who wear deep red and golden tunics and carry shields decorated with a stylised symbol of a setting sun. Dwarves have had to fight for so long, and for so many reaons, that it is now second nature to most of their kind. The recent lull in the never-ending orc wars has led to decline in the number of veteran dwarves in the standing army. But their absence has been covered up by the introduction of new pike troops, an idea stolen from the Eszmerian human empire. Dwarven love for missile weapons is apparent in their abundant use of crossbows and the like. Artillery has improved immeasureably in recent times with the new “magic” of gunpowder and artillery pieces have been spotted not only in the gnomish workshops but also in various border forts. The stronghold of Torgmar-Banor, located in the heart of the world mountains, is considered to be the strongest of all dwarven fortresses. Composed of incredibly steep cliff faces and more inhospitable areas than you can count on the fingers of many hands, the area has served as a superb fortress for many centuries. The fact that they had no need to continually defend their holdings in the past – as is the case with most other dwarves tribes – has allowed the dwarves and gnomes of Torgmar-Banor to concentrate on pleasureable and practical inventions. A prime example of this creative powerhouse is their underground rail system, wich predates the aboveground rail system found within the empire by at least a decade, and wich boasts hundreds of miles of track. Working on an ingenious system of conveyor belts and cogs that propel the carriages along level runs and up slopes, gravity (and a skilled driver/brakeman) guides it down slopes where it picks up speed to send it on its way. This system is used for practically all long travel within the fortress. The royal dwarven familiy maintains a clan hall within the strong walls of Torgmar-Banor. Although it is not a castle, as would be expected, the palace was constructed within a large, crystalline chamber within the mountain and it is a glorious sight. In common with most civilised races, dwarves wear different types of uniforms and armour, etc. to identify their allegiance to certain cities or strongholds. These outfits and their corresponding markings are often quite distinctive. the military leaders of their people, the lords are answerable only to the king (the absolute ruler of the many dwarven clans) and are highly respected. With a council of advisors and scholars at their side, they rule jointly over the dwarven armies. It is not unusual for a clanlord to rule for several centuries, stopping only when he is physically unable to lead the army into battle. Following this retirement, he is automatically entitled to join the council of advisors. 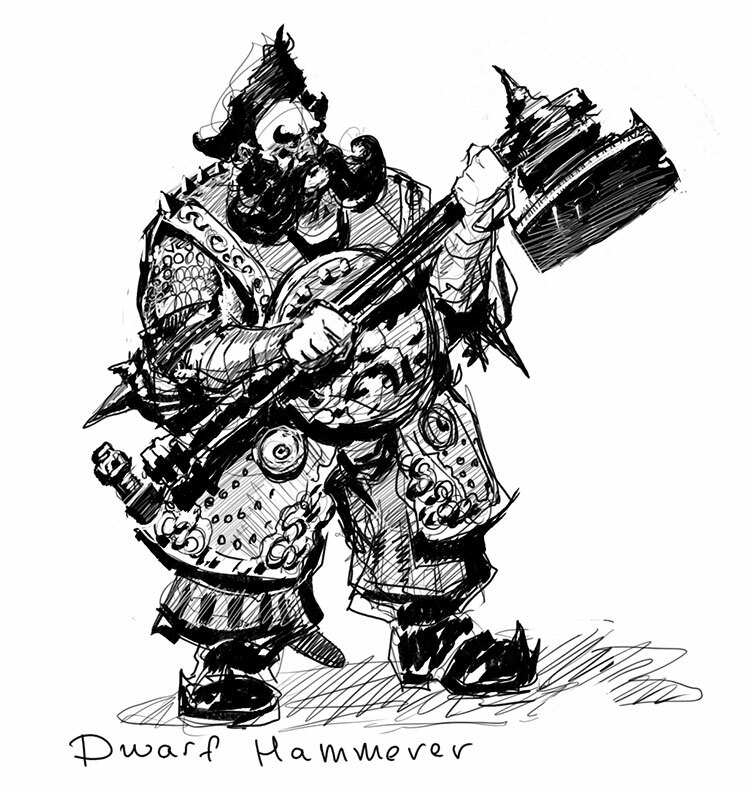 Dwarves have a strong relationship with halflings, obtaining food, etc. for protection and gold. although dwarves have “officially” ended their wars with the orcs, they hate them still and dislike the Formorian and all goblins (including nightlings). They will ally with certain sun elf families and the human empires of eszme and lyeness. As the dwarves follow no religion (at least not officially) but instead believe firmly in the tenets of existentialism, their teachings focus on existence, change, freedom and self cognisance rather than the worship of an unseen being (it is true that dwarves often worship their ancestors but this should not be confused with a religion, as such). their philosophers also function as teachers in dwarven society. Quality games require quality artwork. We are here to provide you with affordable, royalty free fantasy artworks for your board-game, card-game, computer-game or mobile-game. Browse and buy over 1.500 professional artworks available at our art shop: Fantasy Stockart. Next post: What is a tabletop RPG?